Here I am again, in the final stretch of a very long game development cycle! This time, I have learned a lot about Chipmunk-js, especially its shortcomings. I've also studied a lot of new mathematical concepts and failed at art. With just over one hour remaining in the Github Game-off, I think I've completed about as much as I could have. Created a Balloon class that draws "teardrop" shaped balloons. 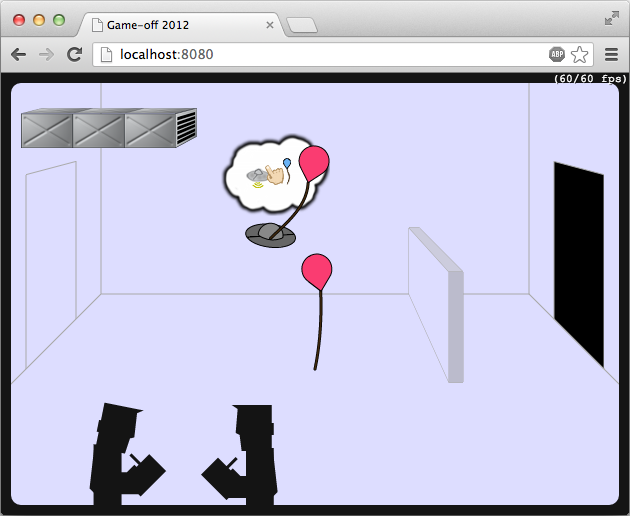 Implemented general item cloning (only enabled for balloons). Clones can be attached to some items (only the player, for now). Added an air flow current, represented by the ugly AC air ducts. Added tutorial objects that spawn after 15 seconds, intended to help players understand the controls. Added an electric zap from the flying saucer every time it creates a clone.